B major chord for guitar in different forms, both open and barre chords. The primary chords that sound good in a chord progression with B is: C#m, D#m, E, F#, G#m. B (XX4442) is more correctly named Bm/F# since the bass note is F#. This is nevertheless a good choice if you want to play B major in a basic form. The alternative shape (XXX442) is theoretically correct, but include only three strings which not may produce the wanted sound. The second diagram show the chord played with a capo on 2nd fret. Index (1st) finger on 1st (thinnest) string, 2nd fret. Middle (2nd) finger on 4th (thinnest) string, 4th fret. Ring (3rd) finger on 3rd (thinnest) string, 4th fret. Little (4th) finger on 2nd (thinnest) string, 4th fret. The notes that an B chord consists of is B, D#, F#. To get B7 add A. To get Bmaj7 add A#. To get B6 add G#. 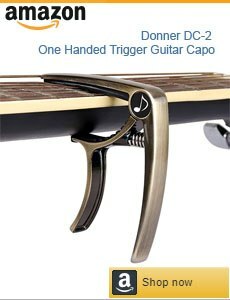 A shape with a capo on 2nd fret (see picture). G shape with a capo on 4th fret. E shape with a capo on 7th fret. 1st inversion: B/D# (means that D# is the bass note). 2nd inversion: B/F# (means that F# is the bass note).